Your Liebherr WTes 1672 Vinidor is guaranteed to be the lowest price in the UK. The price includes installation, a digital hydrometer and vibration reduction blocks. The WTes 1672 has a stainless steel cabinet with an insulated door. 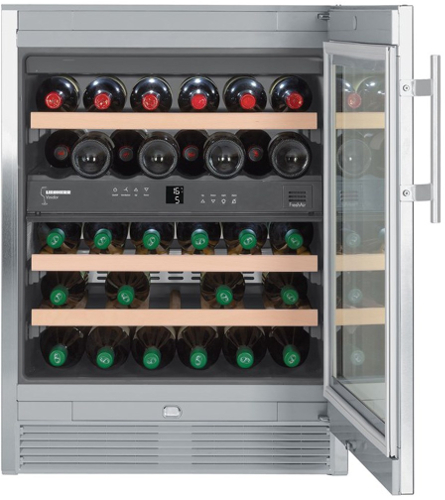 It has a storage capacity of 34 bottles comprised of 2 independent zones. Of it's type the WTes 1672 is the most energy efficient with an A energy rating. How can Cavepromotor offer the lowest price of your Liebherr WTes 1672 Vinidor? Please note when siting the WTes 1672 you need to be able to open the cabinet door to a 90 degree angle so the telescopic shelves will slide out with ease. When you buy your Liebherr WTes 1672 from Cavepromotor you will receive a free digital hydrometer. This helps you to monitor the level of humidity within the cabinet. If it drops too low you can switch on a fan to raise the level. Our wine cabinet specialists are always available to offer advice free of charge. Environmental vibration can have a negative effect on the ripening of your wines. This will be reduced by at least 95%. When you buy the Liebherr WTes 1672 from Cavepromoter as you will be supplied with 4 reduction blocks. Please advise us prior to your Liebherr WTes 1672 Vinidor delivery, should there be an issue at the entrance to your home with these stated dimensions. The location of the Liebherr WTes 1672 can not be underestimated. In the product information it lists the cabinet width when the door is opened at 90 degrees. For ease of use it is recommended you can open the door to 115 degrees adding an extra 20 - 25cm to the width. If you have any questions regarding the temperature settings which are not covered in the instruction manual please contact us directly. Our wine specialist are available to help with any queries relating to your Liebherr WTes 1672 Vinidor.